This room is 16-20 m² and has shower/WC, cable-TV, 22" flatscreen TV, minibar and free WiFi. The bed measures 200x90 cm. An extra bed is not possible for this category! This room is 12-14 m² and has shower/WC, cable-TV, 22" flatscreen TV, minibar and free WiFi. The economy rooms are on the first floor in our original building and are not directly accessible by elevator. The economy rooms are on the first floor in our original building and are not accessible by elevator. 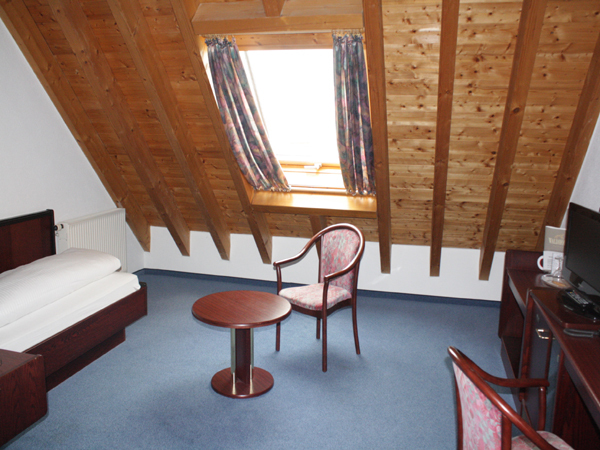 This room is 16-20 m² and has shower/WC, cable-TV, 22" flatscreen TV, minibar, hairdryer, make-up mirror and free WiFi. The standard rooms are on the first and second floor in our original building and are not directly accessible by elevator. 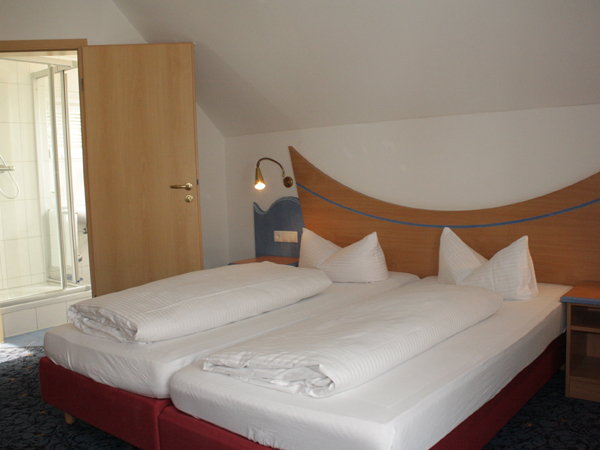 There are two beds in the room that measure 200x90cm each and they can also be used separated. This room is 22-24 m², has a balcony, shower/WC, cable-tv, 32" flatscreen TV, minibar, phone, desk, hairdryer, make-up mirror and free WiFi. The comfort rooms are in the new building. On the first and second floor alle rooms have got a balcony and are accessible by elevator. 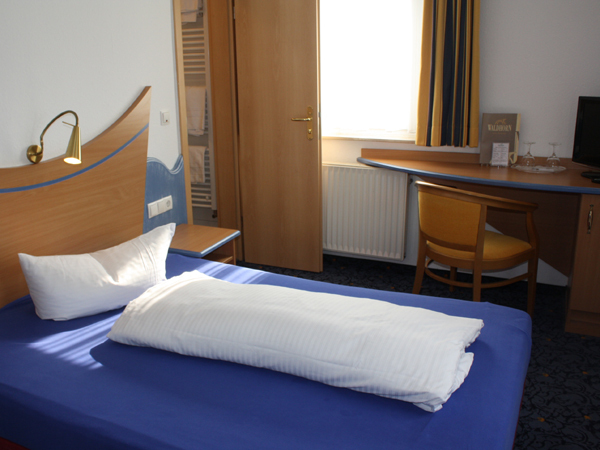 For the extra bed we charge 25,- Euro per night. 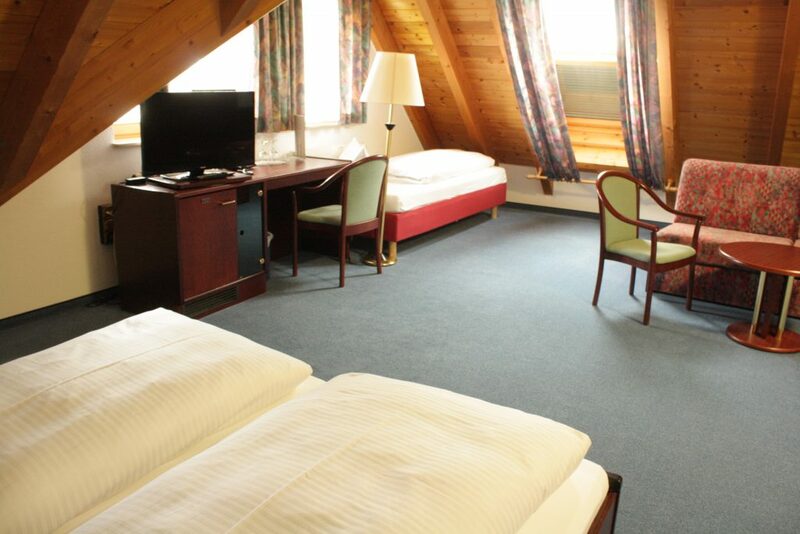 The room is at least 24m² big and includes roof slopes, it has shower/WC, cable-TV, a 23" flatscreen TV, minibar, phone, desk, hairdryer, make-up mirror and free WiFi. The triple room is in our new building on the third floor. There is a lift up to the second floor. The third floor is only accessible by stairs. The beds measure at least 200x160cm. They can't be used separated. The third bed measures at least 200x90 cm. Prices may vary depending on season. You can find the currently valid rates for your desired travel period on our online booking portal..
For booking via our booking portal you will receive a bonus up to € 5,- per room and night. All rooms have shower/WC, cable TV, phone and minibar. The price per night includes our breakfast buffet, car park or underground car park, free Wi-Fi and the usage of our sauna. For half board, including breakfast and a three-course menu in the evening, we charge € 24,- per person and day. Half board is only possible for a minimum stay of at least 3 nights. It's also possible to book half board directly in our hotel. 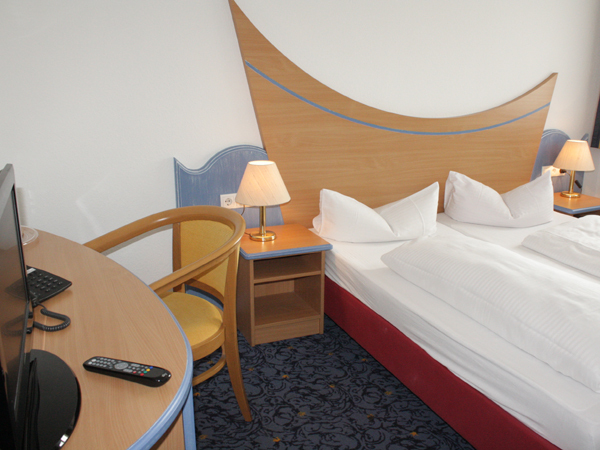 The extra bed (which is only possible in the comfort catagory) is € 25,- per night. For a baby bed we charge € 10,- once. Dogs are allowed against a payment of € 10,- per day. We accept EC card, Maestro, MasterCard, Amex and VisaCard. For single and group flat-rates please ask for our current offers. You can concact us via phone under 0 75 41 / 95 70 as well as via Email under mail@waldhorn-friedrichshafen.de We are looking forward to your request.